Cape Town - New Zealand coach Mike Hesson said on Saturday that a "horror session" had upset his team's plans during the first Test against South Africa. 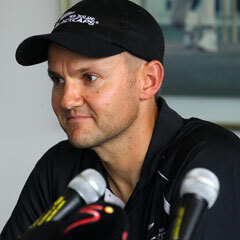 Speaking the day after New Zealand crashed to an innings and 27 runs defeat inside three days at Newlands, Hesson said the match was dictated by the first two hours when the Black Caps were bowled out for 45. "It was a horror session that set the game up," he said. As a consequence of being bowled out so cheaply, the New Zealand bowlers had been searching too hard for wickets in an effort to get back into the game. "As much as we talk about sticking to our plans the human element comes over," said Hesson. "You are trying to get back into the game in a short space of time and by doing that you go away from your plans and they were able to get away from us." Hesson said the decision to bat first had been taken after much consultation. "We spoke to the groundsman, a lot of locals and discussed it among the senior players. "It wasn't an easy decision. We saw the nature of the cracks on the pitch. Last year Sri Lanka put South Africa in and they got 580 and according to reports the cracks got bigger as the match went on. "It was a brave decision and by lunch-time we would have loved to reverse it." After a mauling on the first day, New Zealand performed much better on the remaining two days. "We showed that we were able to compete for decent periods of time but one terrible session came back to haunt us." Hesson said the team would face another tough challenge in the second and final Test starting in Port Elizabeth on Friday. "We know we've got to be extremely strong mentally and we showed that in the latter part of the (first) game," he said.